Very few days pass but that we don’t hear of some new sorrow. A job is lost, a troubled marriage…a near relation passes away, serious illness falls, dashing promises and hopes…a calamity strikes affecting the national interest…a friend loses his track and ceases to practice the Faith. And of course the Christian is beset with a consciousness of his own daily sins and failings. Herodotus relates that a certain tribe among the ancient Thracians celebrated births and deaths in an unusual way. When a child is born all its kindred sit round about it in a circle and weep for the woes it will have to undergo now that it is come into the world, making mention of every ill that falls to the lot of humankind; when, on the other hand, a man has died, they bury him with laughter and rejoicings, and say that now he is free from a host of sufferings, and enjoys the completest happiness. Life must have been pretty difficult for those ancient Thracians. But sorrow is universal as the psalmist testifies…or rather sings! I have laboured in my groanings, every night I will wash my bed: I will water my couch with my tears. My tears have been my food day and night, While they continually say unto me, Where is thy God? Our lives carry on in their allotted paths, beating out their own rhythms and music and certainly moments and prolonged stretches of happiness but punctuated every now and again with the refrain of sorrow, the song of sorrow. If that sorrow is not our own it is that of another whom we love, and therefore it is our own. Behind all the smiles, under the surface of the laughter is the sure refrain of sorrow and tears and pain. None but the young, or those who are sleeping, could be unaware of this. Time, the incomparable and inexorable teacher, teaches one lesson consistently. It is this: The Song of Sorrow. But those who are fortunate enough to have been nurtured in the hopeful climes of the West, who have basked their minds and hearts in the rays of the Mediterranean sun, who have suckled their souls on the milk of pagan poets…they know that the song of sorrow does not end with sorrow. αἴλινον αἴλινον εἰπέ, τὸ δ᾽ εὖ νικάτω. Aeschylus, the great tragedian saw a glimpse of Easter joy five hundred years before Christ conquered death. Aeschylus knew through a glass darkly that an Easter Joy prevails and crowns the Lent of life. The Blessed John Henry Cardinal Newman (by antonamasia, The Apostle of Liberal Education) saw more clearly than anyone how the oracles of nature prepare the Christian mind for the Gospel of grace. Aeschylus’ chief role is not primarily that of an instructor. No, he makes us feel the things about which he instructs. He orients our hearts rightly about those things, as is the aim of any good poet. And we learn that the meaning of our suffering is not suffering but the meaning of suffering is truth! 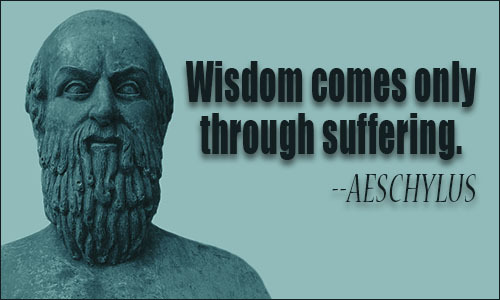 Tis Zeus alone who shows the perfect way of knowledge: He hath ruled, men shall learn wisdom, by affliction schooled. For whom the Lord loveth, he chastiseth; and he scourgeth every son whom he receiveth. Persevere under discipline. God dealeth with you as with his sons; for what son is there, whom the father doth not correct? Now all chastisement for the present indeed seemeth not to bring with it joy, but sorrow: but afterwards it will yield, to them that are exercised by it, the most peaceable fruit of justice. Aeschylus’ Orestaia begins as a song of sorrow but ends not only with justice but the very establishment of the first tribunal of Justice in Athens. Through the will of the gods the law of revenge is abolished and the ancient Furies are transformed into Eumenides, the kindly ones. The student of nature knows that sorrow is the school of wisdom. The disciple of grace knows that sorrow is the school of Joy. Nature is reflection and sign, a sacrament of sorts, of the invisible things of grace. To those who are inattentive to nature and grace life must be nothing but a song of sorrow. But to those who embrace this sorrow life is a song that ends in triumph! This entry was posted in aeschylus, Newman and tagged aeschylus, Herodotus, John Henry Newman, Saint Paul. Bookmark the permalink.